I don’t know anyone who doesn’t love chicken pot pie. This version hits all of the same notes, without the need for baking a ramekin or messing with puff pastry. With minimal prep (and a few strategic shortcuts), this is a great slow cooker make ahead meal for rainy weeknights or busy weekends! Put large dutch oven over medium high heat. Add olive oil and brown chicken thighs (seasoned with salt and pepper) in batches, 10 minutes total. Once chicken is browned, remove and set aside, and add in butter and onion to sweat. Add in garlic to sweat for 1 minute. Once simmering, add in chicken, mixed vegetables, bay leaves, thyme, and a heavy pinch of salt and pepper. Simmer for at least 15 minutes, or set in slow cooker for up to 6 hours. 15 minutes before serving, heat oven to 375 deg. Lay out crescent dough into triangles, bake for 9-10 minutes. *Yeah, you could dice carrots, shave ears of corn, cut green beans, etc. But the frozen bag, which is generally high quality, saves time and money. Don’t be afraid of this shortcut! ** Again, could you make your own crescent dough or puff pastry? Sure. It’ll only take about an hour of prep, up to overnight for resting, and some pretty tricky technique too. Me? I’ll be popping tubes of dough all day long. ***I use flour and cornstarch here to thicken, which I recognize is unconventional. 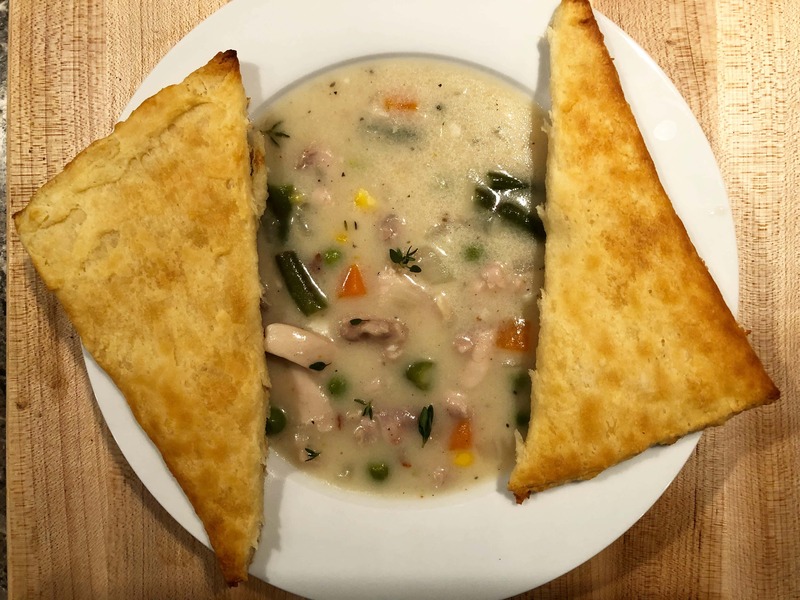 I prefer how the flour gives the soup body, while the corn starch adds a certain creamy glossiness that I associate with chicken pot pie.